by Emma Smith and Andrea Goldstein, first year students, MPhil Textile Conservation. As part of the first year conservation course, we take a class along with some of the Dress and Textile Histories students called Understanding Textiles where we learn about various techniques for making textiles and yarns. 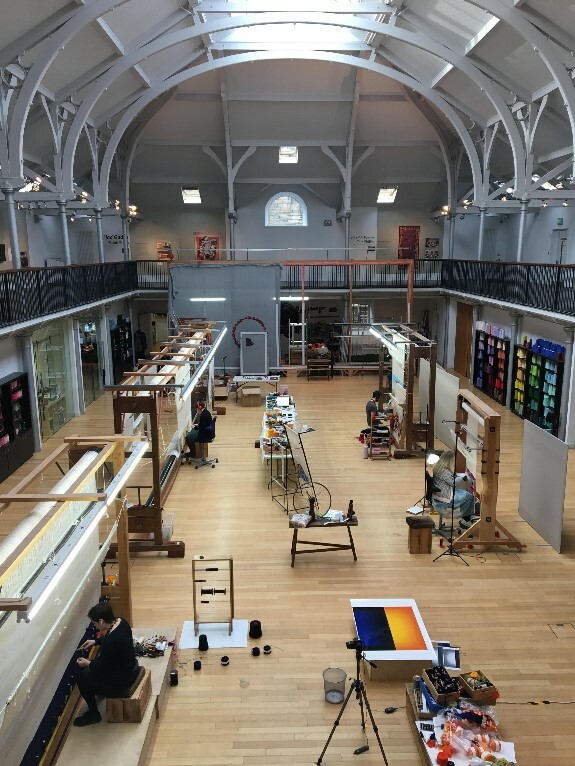 Recently, we covered weaving and as an extension of that we visited the Dovecot Studios in Edinburgh to get a first hand view of the process. Our tour was given by the wonderful Jonathan Cleaver, a graduate of the MLitt in Art History: Dress and Textile Histories program, a weaver at the studio until recently, and a PhD candidate at the University of Glasgow. With his box of samples he explained to the group the key features of the design process and the construction method behind tapestry weaving while walking us around the second floor balcony. From above, we could observe several weavers in action working on tapestries of various sizes and colour. Two apprentices, one outgoing and one incoming, were also at work. Jonathan informed us about the three year apprenticeship where apprentices can learn the in’s and out’s of tapestry weaving and explore their creative direction. We also saw (and heard) gun tufted rugs being made. This process involves an electric gun, which when applied to the backing fabric pushes yarns through to create a pile on one side. The artist freehand draws a design with the gun, cleverly blending lines and colours to create the effect. Dovecot Studios weaving space @courtesy of Dovecot Studios, 2017. Next on our tour was the Dovecot Gallery, where Jonathan focused on a few pieces that are both artistically interesting and complex conservation-wise in the Daughters of Penelope exhibition. One piece, For Irena Sendler by Joanne Soroka, blended cotton, wool, linen, metallic threads and paints, as well as approximately 2,500 ash tree seeds to create the tapestry. Thinking about the conservation issues associated with this piece led to discussions about the intricacies of handling and conservation of a fragile multimedia object. 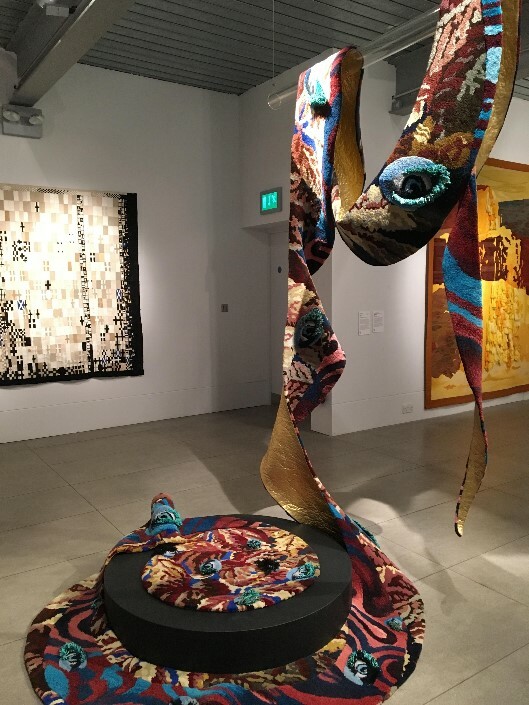 We also learned about the story of a tufted rug, Diagrams of Love: Marriage of Eyes, designed by artist Linder used in the performance Children of the Mantic Stain, by Northern Ballet and displayed in the British Art Show. Conservation issues involved in this piece include the exposure to sweat and mechanical damage from the ballet performances, the vertical stress it experiences while hung, and the deterioration of the latex backing. Jonathan then took us to the National Museum of Scotland to view several interesting pieces made by the Dovecot team that were on display. Diagrams of Love: Marriage of Eyes performance rug @courtesy of Dovecot Studios, 2017. 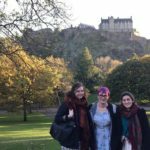 We had the afternoon to explore Edinburgh, with some of us staying on at the museum and others perusing local vintage and beading shops. A number of us first years then stayed the night in order to attend the ICON Conservation Conference, run jointly by the ICON Scotland and ICON Care of Collections groups, held on the Friday. We were also joined by the second years and some of our tutors. Throughout the day we listened to many interesting presentations from an array of disciplines within conservation that provided important take-away messages that apply to all aspects of conservation. Some of the key themes amongst the presentations included raising the profile of conservation in the community through film and events such as crowdsourcing. Others focused on the importance of risk assessments, the contribution of conservators in decision making within their establishment, and the significance of ongoing environmental and object monitoring. Abstracts of the event can be found here. The event was also a great chance to meet and network with professionals in the conservation field across Scotland and the UK. Overall we would like to thank Dovecot Studios and Jonathan for the wonderful tour and to all of the speakers and organisers of the ICON conference for an informative day!